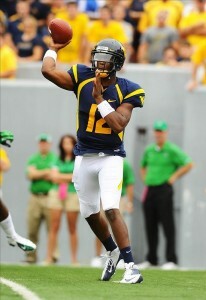 ESPN draft analyst Mel Kiper has a much higher opinion of Geno Smith than fellow quarterback prospect E.J. Manuel. "I like the fact that he can spin the ball," Kiper said of Smith on a conference call. "He's got the live arm, he can make any throw you want. He's mobile, very good mobility. Can beat you with his legs. He can run, pick up significant yardage. He's a kid that seems like he's going to work hard at his craft." Kiper anticipates the Eagles drafting one of the two quarterbacks. In a recent mock draft he had the Birds choosing Smith with the fourth overall pick. Manuel would be the fallback. Speaking of which, Kiper feels Manuel didn't play up to his talents and only reads a portion of the field although he puts a late first, early second round grade on the passer. Smith's weakness is functioning in a collapsed pocket. "When he was harassed, the accuracy diminished and he made some bad decisions," Kiper said. "He had some fumbles in the pocket. Ball security was an issue. He's got to take better care of the football. Can't have fumbles in the pocket. He's got to be a little more precise with the football." All of that said, Smith puts the ball in spots enabling receivers to get yards after the catch. "He reads the whole field, which I like," Kiper said. "He's not just reading half the field, he reads the whole field. He's the kind of guy that if handled properly could be a very, very good starting NFL quarterback, I believe."